During Glacier National Park’s 2010 centennial, I wrote quite a few posts about the history, personalities, facilities and environment of Montana’s shining mountains for this weblog. Now, Vanilla Heart Publishing has compiled a selection of those posts into a free PDF e-book that you can download from PayLoadz. I hope you will enjoy Celebrate Glacier National Park and the scenery behind my stories with a bit of the history of how Glacier came to be and who took part in developing it as both a park and a playground. Of course, you need to do more than read about “backbone of the world” in northwestern Montana. How about a trip? You’ll need to stay for a couple of days so you have time to see both sides of the park, experience Going-to-the-Sun Road, hike to Sperry or Grinnell Glacier, take a launch trip on Lake McDonald, Swiftcurrent Lake or Lake Josephine, and ride in one of those ancient red buses with the top down so you can enjoy the mountain air. Wonderful. You know so much about Glacier, Malcolm. Can’t wait to read this one. Thank you, Earth Mage. Our fine publisher did most of the work in compiling all the posts. I have no doubt. Which is one of the reasons she is such a fine publisher. 😎 Then again, with fine authors like you, it probably wasn’t much of a chore to do, although it still was probably a monumental task! Thanks so much, this is great! We will be coming to Glacier for our first trip in early July from Alabama…Hope the road is open by then…fingers crossed! Last year, Sun road finally got the snow ploughed off it later than usual. July is normally “okay” for most roads and trails, though. Have a great trip. Thanks for the link, Malcolm! I forwarded a link to this post to a friend of mine who also worked in the Park during his college years. Thank you, Montucky. I had a lot of fun writing the centennial posts. I’m glad to have them collected into an e-book. I hope your friend enjoys the words and pictures. Sounds very cool. I love National Parks, but have yet to visit Glacier. Thank you, Beverly. I hope you get a chance to visit “the shining mountains” some day. 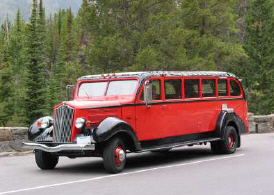 Have visited Glacier National Park a few times,Loved “The Going To The Sun Road” absolutely fantastic and. the info and look out point at the top is breath taking. as are the emerald lakes. Just longing to see it all again. Thanks to all the wonderful staff through-out the park. That road is amazing–and so are the views along the way. Hopefully, this year it won’t have a GIANT snowdrift delaying its opening like last year. Wow, thanks Malcolm! I love stuff like this. You’re welcome, deniz. I’m glad the Glacier centennial gave me a good excuse to write all the original posts about the park. Malcolm, Thanks for this! I first visited Glacier when I was about 10 years old (45 years ago!). My family did the ranger-led hike to Granite Park Chalet where we spent the night – memorable!. That was back in the heyday of the national parks when there were many such opportunities. I’ve returned twice since and truly love Glacier. Saw my first mountain lion in the wild on a day trip over to Waterton Lakes. When I retire, I hope to spend a summer there driving the red buses. BTW, Smoky is my cousin and we share the same wanderlust! Hope you enjoy ther e-book. Spending the night at Granite Park Chalet is almost like spending the night out in the woods. I also enjoy Waterton, especially when I get away from the crowds in the town itself. However, the Prince of Wales Hotel has great dinners. So, you’re vouching for him them, aye? Yup, that I am. He’s very cool.